P-840 / P-841, dimensions in mm. Sensor included only with P-841. Response behavior of a P-841.10 to square wave control with an amplitude of 3 nm. Servo setting: 240 Hz bandwidth, 2 ms settling time. 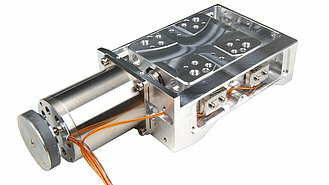 Piezo actuators do not require lubrication and do not cause abrasion. 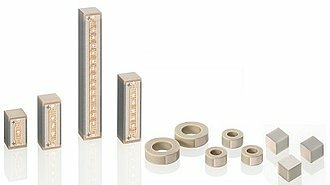 The all-ceramic isolated PICMA® actuators also do not require polymer isolation and are therefore ideal for vacuum applications. * Versions with SGS allow closed-loop linearity up to 0.15% and are shipped with performance reports. ** The resolution of the system is only limited by the noise of the amplifier and measuring technology because PI piezo actuators are free of friction. *** Dynamic small-signal stiffness is approx. 30 % higher. Voltage connection: LEMO FFA.00.250. Coaxial cable RG 178, 1 m.
Sensor connection: LEMO FFA.0S.304. Cable, 1 m.
Housing / tip material: Stainless steel.